It is sometimes called the Inferior Dental Nerve which gives off a motor branch supplying the Mylohyoid and the anterior belly of digastric and travels through the Mandibular foramen and enters the Mandible. After entering the Mandible it supplies to the following Mandibular Teeth: 2nd Premolar, 1st, 2nd, and 3rd Molars. It extends Anteriorly forming the Mental Nerve at the level of Mandibular 2nd Molar roots exiting the mandible through the Mental foramen. And Supplying Sensory nerve fibres to the Chin and Lower lip of that Side. It further extends anteriorly as the mandibular incisive nerve to supply the Mandibular incisors and Canine. Note: To anesthetize the soft tissue posterior to the 1st molar Long Buccal nerve should be anesthetized. For Extraction, Root Canal Treatment, Flap surgery, Implant placement or any other Procedure on Mandibular Teeth. Surgical procedures performed on Soft tissue and Hard tissue anterior to the First Mandibular Molar where Inferior alveolar nerve block along with anesthesia to Lingual nerve should be given. Surgical procedures performed on Soft tissue and Hard tissue posterior to the First Mandibular Molar where Inferior alveolar nerve block along with anesthesia to Long Buccal nerve should be given. Needle passes through the Mucosa, Thin Plate of Buccinatormuscle, Loose connective tissue and Fat. These are the structures present adjacent or surrounding the Needle when the needle is in final position where the Local Anesthetic Agent is deposited. The Head of the patient is placed such that his/her Mouth is open and the Body of Mandible is parallel to the floor. The Dentist / Operator uses his/her left index finger or Thumb to palpate the Mucobuccal fold. If thumb is used teh index finger can be placed on extra orally behind the ramus thus holding the mandible between your thumb and index finger to assess the width of the Ramus. The finger is then moved posterior to contact the External oblique ridge on the anterior border of the Ramus of mandible. From here it is moved up or Down in search of the greatest depression called the Coronoid Notch which is in direct line with the Mandibular sulcus. The palpating finger is moved lingually across the retromolar triangle and onto the internal oblique ridge. The finger which is on the coronoid notch and in contact with the internal oblique ridge is moved to the buccal side to move the Buccal Sucking pad away the path of insertion. This gives better exposure to the internal oblique ridge, the pterygomandibular raphae and the pterygomandibular depression. The patient is asked to keep his/her mouth wide open. 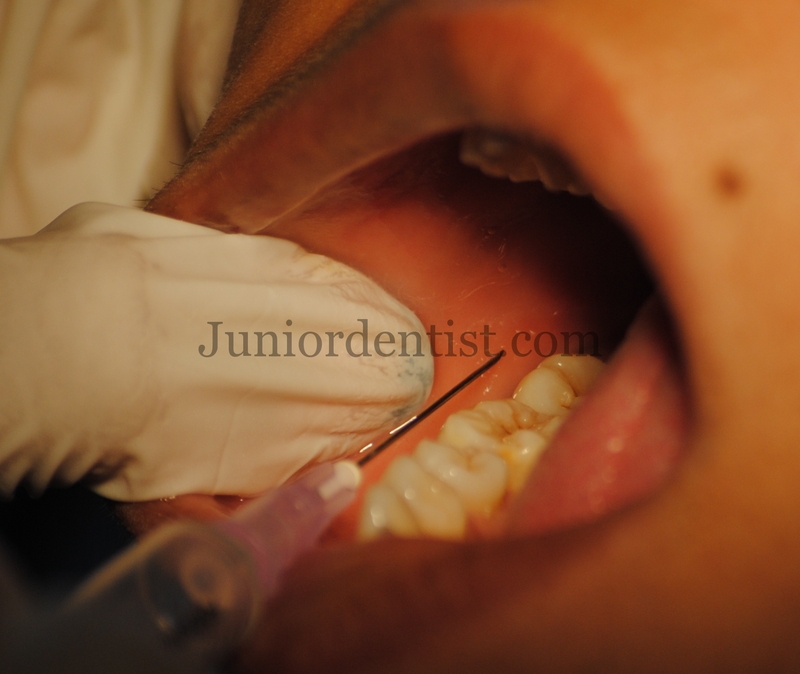 The Needle is inserted parallel to the occlusal plane of the mandibular teeth from the opposite side (Approximately over opposite side Premolar) of the mouth at a level bisecting the finger or thumbnail penetrating the tissues of the pterygotemporal depression, and entering the pterygomandibular space. The needle is penetrated until bone is contacted on the internal surface of the ramus of the mandible. This is the place where the Mandibular sulcus funnels into the Mandibular foramen. After contacting bone the needle is withdrawn about 1mm and then 1 to 2 ml of solution is deposited slowly over a duration of 2 minutes into the tissue. Technique for Anesthetizing Lingual Nerve: The needle is withdrawn about half of its length which was inserted and the Local anaesthetic solution is injected in the area which anesthetizes the Lingual Nerve. How to determine the depth or length of the needle to be inserted in Inferior alveolar nerve block ? Subjective Symptoms: Tingling sensation and Numbness of the lower lip and the tip of the tongue when Lingual Nerve is anesthetized. Objective Symptoms: Instrumentation should be done, use either the Tip of a blunt Probe or Elevator to check for Objective symptoms. The anesthetized tissue and teeth should be pressed and tapped as compared to the normal side without anesthesia. Muscle Trismus, Hematoma, Needle Breakage, Mucosal irritation and Transient Hemifacial Paralysis is the term used for depicting the Complication of Inferior Alveolar nerve block. Also Check out other nerve block techniques like Infra Orbital Nerve Block Technique and Posterior Superior Alveolar Nerve Block. Thank you Varun..You are doing a great job..thanks for helping everyone out here..God bless you.